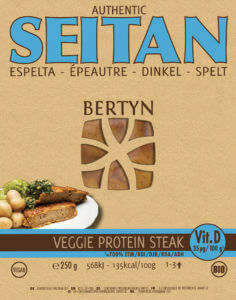 Discover Bertyn’s seitan pepper steak, the ideal protein replacement to fry or grill. This organic pepper steak is prepared with spelt seitan according to traditional methods. With a delicious, subtle almond pepper sauce. Fry or grill on both sides for 5 minutes. Then add the sauce and you’re done! Or place the package in boiling water for 5 minutes. Straight away you will taste its delicious soft taste. Mouth-watering! And with a filet mignon texture. 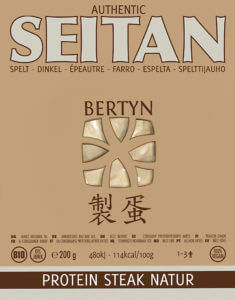 You can find Bertyn in the fresh food section at your local health store. Pepper Protein Steak find your fresh in the cooler of your health food store. A package of Pepper Protein steak contains 350 g.
Store in a dark and cool place at a maximum of 7 ° C.